How do I Convert PDF File to Image Format? MS Word has been a standard document creating application ever since Microsoft Windows was introduced to the world of computing. Then in 1993, Adobe unveiled the ‘Portable Document Format’, which was a huge leap forward in the field of digital documentation resulting into the idea of “Paperless Office”. The PDF format was only meant for secure document exchange initially. The creation of PDF documents was also an expensive process. But those days are long gone. Nowadays, there are many free and paid softwares available in the market that allow conversion of PDF files to editable Word documents. Classic PDF Editor is one such great addition to the rapidly growing PDF world. It offers a rich features which include conversion of more than 500 printable file formats to PDF. These functionalities have enabled Classic PDF Editor to truly extended the boundaries of the PDF format to a level which seemed impossible only a couple of years ago. The conversion of PDF documents into fully self-contained JPEG, BMP, GIFF, and PNG images is one of the distinguished features offered by Classic PDF Editor. Why to convert PDF to Image? Image files have universal support on devices of any kind and size. Sharing a document in an image format ensures complete security, optimized size and impeccable quality of your work. Classic PDF Editor’s PDF to Image conversion allows you to easily view your documents on any devices or share them on your social media accounts without any hurdle. Simply go to Classic PDF website and download the setup file from the home page. 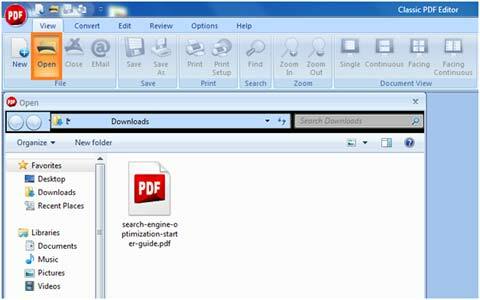 Step 2: Double click the PDF setup icon and follow on-screen instructions to install the software. A desktop shortcut will appear on the screen after installation. 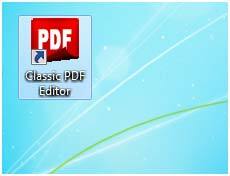 Step 3: Double click the desktop icon to run the Classic PDF suite. An assistant will appear where you can either choose to buy the full Classic PDF suite or close to buy the free trial version. Step 4: Click on the “Open” button and locate your desired PDF file to open. Step 5: Select the Convert Tab from the main menu located on the top window pane and head over to the Export Section. 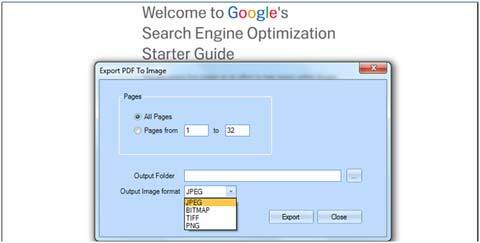 Select the ‘PDF to Image’ conversion button which will open the assistant. Select the desired PDF file(s) that needs to be converted into an image along with your output folder and desired image format. The default format is JPG but our software also supports PNG, BITMAP and TIFF formats. Step 6: Hit the ‘Export’ button and wait for the conversion process to complete. Step 7: Once the conversion process has completed, you can access the processed images in your destination folder. What makes Classic Desktop Everyone’s Favorite? Classic’s PDF File to Image Converter is equipped with groundbreaking features and tools that allows for up to 6400% text magnification, non-cluttered navigation, professional editing and full compatibility with Windows XP, Vista, 7, 8, and 10. Our applications are designed to make the entire process of converting PDF files to static images easy, halts-free and fast. It takes a total of three minutes time to download our complete PDF management suite and an additional two to three minutes for its installation. Also, the installation process does not require any rebooting and you can immediately start using the software. Limited time EXCLUSIVE offer: Save up to 30% off on our Classic PDF Editor suite by booking your order today! Enjoy unlimited conversions, ad-free access and more with our PDF File to Image Converter.